Not all people have time to write length article, but they have good idea to share in small character. Twitter connects people like that in their platform. Then twitter is popular. This is several fact about twitter. Today, in September 2018, they have 246 million international users. 500 million total numbers of tweets sent per day. 80 percent of user is on mobile. There are over 69 million Twitter users in the US. The total number of Twitter users in the UK is 13 million. That situation can help your business in several ways. Twitter helps you to connect to your market segment. You can found their interest by identify on their content and their tag (#). You can also know their interest by what people that they follow. Fish hobbies follow about fish. And so on. In addition, the opportunity is you can contact directly to your market. You can find what the popular issues in your country are. It can drive traffic to your landing pages or your business offer. What is something to talk about in twitter? You can talk about your positioning or your value proposition. Why your value proposition is better than other. We can talk about your value proposition indirectly or not literally. You can talk about popular issue. How your business or product can help it. We can reply what your market segment says. This copywriting brief can help you to create tweet. Create events online and ‘tweetups’. A tweetup is an organized, in-person gathering of people on Twitter. The usual reason for a tweetup is to gather people with the same interests to share ideas. We can use tweetdeck on https://tweetdeck.twitter.com. 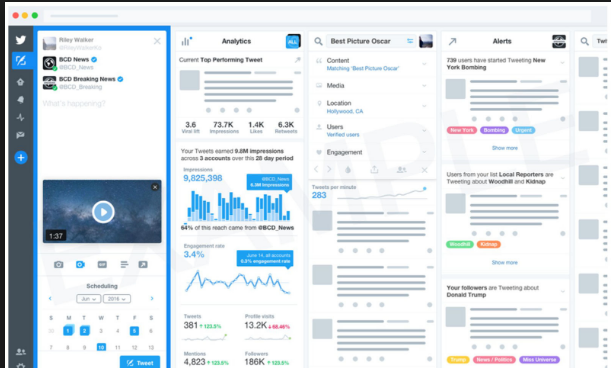 TweetDeck offers let us view multiple timelines in one easy interface. It includes: Manage multiple Twitter accounts, schedule Tweets for posting in the future, build Tweet, monitor best twitter. Communication between company and segment market is important component for business. Business continues based on transaction between market and company’s offer. They make transaction based on communication that blogging can do. There is benefit of blogging for promoting your business. So blogging is part of growing your business. Blogging help your company to find customer. Customers find your blog by typing keyword on search engine. So the customer that find your customer have interest to your customer. Blogging is medium to build your persuasion. You need content that provide word, picture, video, or sound. You have not to have all. One of them is enough. You can write about product to seduce customer. This is guide to write copywriting to seduce. You need domain name. There are two options paid and free. Free usually subdomain that accompany with free hosting. Subdomain is for example yourname.blogspot.com. Paid domain name is not subdomain. You need blogging platform where you place your content. There are many kind of medium, free and paid. Free hosting is hosting that provide by company that provide free hosting include their software. Example is wordpress.com, blogger.com, tumblr.com, medium.com, weebly.com . Self-hosting is rent for hosting then you buy domain name. Is it easy to create free blogging? Yes, it is easy. One you need to do is fill the form. For example you create blog using blogger.com. Login. If you didnt have google account, register. 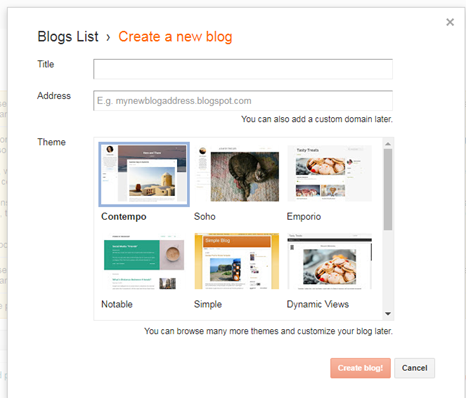 Fill form, title of blog, address of blog, theme that you prefer, then click orange button, create blog. Voila. You already create blog. To create new post, click button, orang button, new post. Fill title post title and writing to post form. You has to have content. You buy hosting from hosting provider. That is many hosting provider for example, hostgator, bluehost. You can check their hosting offer in their cart and click buy, fill the form. Then you get email about how to access your hosting. There many kind of hosting. First is shared hosting. Second is virtual private server. Third is dedicated server. Dedicated server is one computer for your hosting. You can fill it with many domain. This is strongest hosting so if your blog have many thousands visitor, it is okay. Virtual Private Server is one virtual OS server only for you. One computer can have several virtual OS server. It can leave company from illusion about their strong, immunity, infallibility that lead wrong decision. 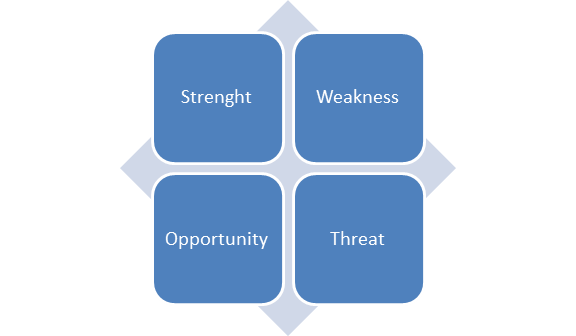 SWOT analysis makes you feel good, because another company also have strength and weakness. The SWOT open your mind to opportunity and treat that business environment offer. The SWOT help to deter threats from competition and society. It help to craft strategy using your strength to capture opportunity. Your capacity that helps to reach goal is your strength. Create list about your strength in grid. It is something that under company control. Tangible or intangible supports company goal. Your situation that blocks your goal is your weakness. Create list about your weakness in grid. Internal factors detract company to reach goal. Environments that support your goal is your opportunity. Environments that block your goal is your treats. Threats can happen because of new regulation, political, ecological, social, technological, economic or demographic changes. It can tend to oversimplification. SWOT analysis assumes goal is self-justify. If goal has bad problem for environment and society, they will give negative respond for the company in future. SWOT analysis does not show relationship between components. It also do not show next feedback by component. So it is hide unintended consequences. SWOT analysis is not always objective. The individual has personal bias to create list. It can be diminish important things and expose unimportant things. The SWOT is too general. That is not guide newbie to analyses. Newbie need details. There is no feedback and obligation to verify. It can mislead to wrong decision.